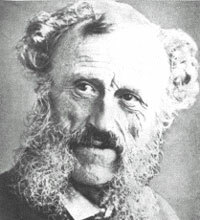 Frederick Timpson I'Ons was born in Islington, Middlesex, England on 15 November 1802. His father was John I'Ons, the master of a riding-school in Islington. Frederick was one of eight children. As a young child, he already showed a talent in drawing and when he was a little older he took lessons from sculptor John Francis. Later, he owned an art school in Marylebone in London. Here he taught drawing, painting, handwriting and commercial subjects. On 31 May 1827 I'Ons married Ann Frazer, with whom he came to South Africa to settle in the Albany district. They arrived at Grahamstown in November 1834, just before the sixth Frontier War broke out. I'Ons participated in the war as a volunteer, but also began to draw a set of cartoons called the 'Aquila Caricatures' as an attack on Cape Lieutenant-Governor Andries StockenstrÁ¶m. He was also commissioned by military officers to do portraits of Black chiefs like Maqoma, Sandile and Khama. His depictions of local inhabitants such as the Khoikhoi and Africans are considered his best work. However, his public preferred paintings of vast, dark landscapes, and I'Ons started to rather paint in this genre. After the eighth Frontier War in 1850, most of his military-based clientele left the district. I'Ons then started to paint portraits of well-known persons in Grahamstown, and he also gave private drawing classes. He travelled extensively through the Eastern Cape, tried to find his fortune at the diamond-diggings in Kimberley, but then went to live in Port Alfred for some months. At the age of 85, he died in Grahamstown. His works are seen as important records of life on the frontier, particularly his portraits of the Khoikhoi and Africans. They are described as 'full of humour and vitality, observation and real understanding' (Potgieter & Du Plessis, 1972: 138). On the other hand, his landscapes are considered to be gloomy (Potgieter & Du Plessis, 1972: 138). His work has been exhibited by the Tate Gallery in London (1948), the South African National Gallery in Cape Town (1976), and King George VI Gallery in Port Elizabeth (1990). Collections of his work can be found in private and corporate ownership, and at museums and galleries like the Africana Museum, Albany Museum, Fort Beaufort Historical Museum, King George VI Art Gallery, SA National Gallery, the University of Stellenbosch, the William Fehr Collection, William Humphreys Art Gallery and the 1820 Settlers Memorial Museum. • Potgieter, DJ & PC du Plessis (eds) (1972), Standard Encyclopaedia of Southern Africa VI, Cape Town, Nasou.